Every year, AC Electric gets hundreds of service calls about dimming lights when a certain appliance is turned on (also known in the electrical industry as brown-outs); arcing noises coming from within the meter base outside or the electrical panel; or partial loss of power. Our experience with these calls have primarily concluded the service was undersized. Although your home is equipped with 240V you may not have a sufficient current capacity to accommodate your new appliance(s). Older homes normally have a 60-amp service, unless they underwent a service upgrade. If your home’s electrical system has not been upgraded, chances are your kitchen appliances are exceeding your service’s capacity, and are at risk for electrical fires! An electric oven alone can draw up to 40-amps. On a 60-amp service, this will leave you with 20-amps for everything else in your home. If you were to use an electric dryer (which consumes 20-amps) at the same time, you would have maxed out your home’s service rating. Combine that with a microwaves (12-amps), refrigerators (3-amps), dishwasher (10-amps), 60-watt bulbs (.5-amps), and so on—it is a fire waiting to happen! On some homes, there is no main disconnect which monitors and trips at certain overload conditions. When the terminals on your meter base and/or electrical panel is maxed out, heat is generated on them—similar to a light bulb. Dimming of lights are common when this happens; and, on some occasions, a fire is generated from within the equipment. Any combustible material in or around the area exposed to the heat can catch fire and put your home at risk. Don’t be fooled by a breaker that displays “100” (amps); too common we approach service equipment with a 60-amp rated meter base and/or undersized wires. Only an experienced electrician can recognize the signs of a properly installed system. Have one of our trained technicians perform a visual inspection of your electrical service before Thanksgiving to ensure a safe and happy holiday. Cooking fires nearly double on Thanksgiving Day, occurring more than twice as often than on another day. Cooking fires are the number one cause of home fires and home fire injuries. 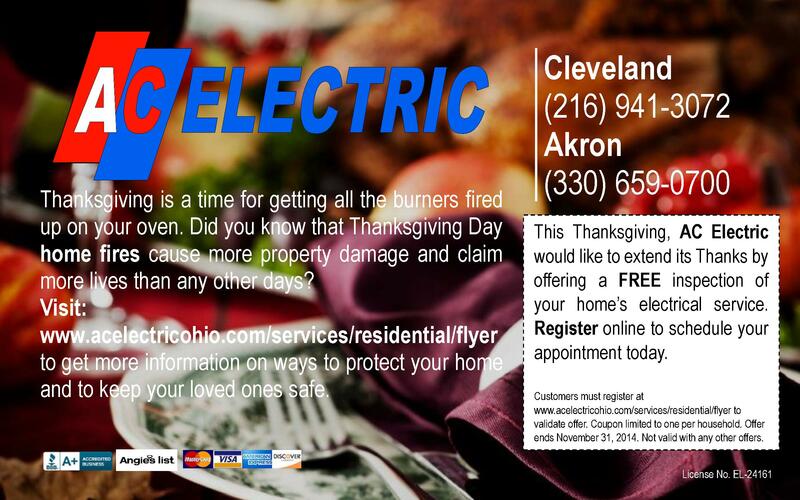 Thanksgiving Day home fires cause more property damage and claim more lives than home fires on other days. Eighty percent of Americans don’t realize that home fires are the single most common disaster across the nation. Every two and a half hours someone is killed in a home fire. In a typical year, 20,000 people are injured in home fires. Having a working smoke alarm reduces one’s chances of dying in a fire by nearly half. Stay in the kitchen when you are frying, grilling, or broiling food. If you must leave the kitchen for even a short period of time, turn off the stove. If you are simmering, baking, boiling, or roasting food, check it regularly, remain in the home while food is cooking, and use a timer to remind you that the stove or oven is on. Avoid wearing loose clothing or dangling sleeves while cooking. Keep kids away from cooking areas by enforcing a “kid-free zone” of three feet around the stove. Keep anything that can catch on fire—pot holders, oven mitts, wooden utensils, paper or plastic bags, food packaging, and towels or curtains—away from your stove top and oven or any other appliance in the kitchen that generates heat. 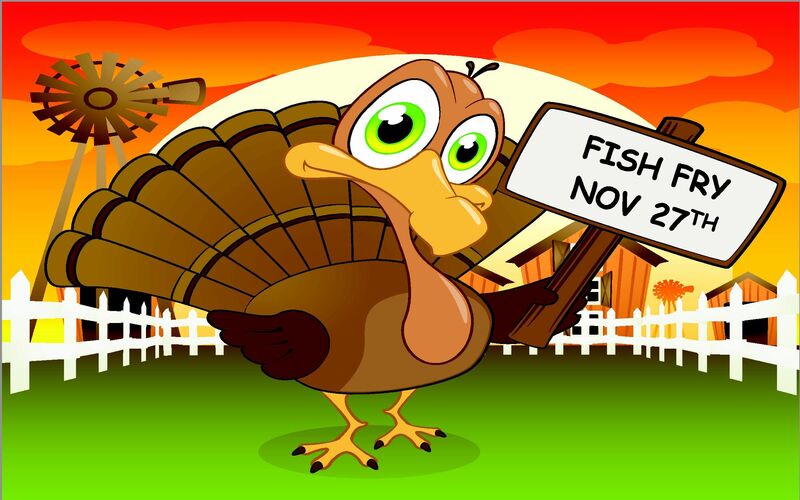 If you must use a turkey fryer, make sure it is outdoors and in an open area away from all walls, fences or other structures that could catch on fire and away from moisture that can cause serious burns from steam or splattering hot oil. Always follow the manufacturer’s instructions. Smoke alarms save lives. Install a smoke alarm near your kitchen and use the test button to check it each month. Replace all batteries at least once a year. After your Thanksgiving guests leave, ask a family member to perform a home safety check to ensure that all candles and smoking materials are extinguished. Keep a fire extinguisher that can put out small fires. Look into purchasing one that not only puts out electrical fires, but also liquid (oil/grease) and paper fires. Visit www.redcross.org/homefires for more information on how to be fire safe on Thanksgiving Day.